This method proposes that ram jet combustion processes be employed to launch a payload into space through a long barrel. In simple terms, a ram jet is nothing but a cone surrounded by a cowling. At very high velocities, the air that passes between the cone and the cowling is compressed, and once adequate compression is reached, fuel is added and ignited. This results in rocket propulsion, but with the major advantage that the engine has no moving parts. The disadvantage is that ram jets require very high initial velocities before they can be started, so this solution proposes that the payload be shaped like a ram jet core, and in practice, the launching device would consist of a long tube filled with a combustible gas mixture to serve as fuel. 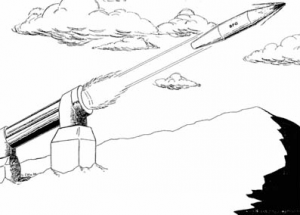 The tube would be sealed by frangible diaphragms at both ends to contain the gaseous fuel, so what needs to happen is that the payload (shaped like a ram jet engine) must be fired into the tube at a sufficiently high velocity to allow the fuel to be compressed to the point where it can be ignited. This velocity would be depend on the fuel used, but the basic idea is that once the fuel is ignited, the payload will continue to burn the available fuel as it accelerates down the tube using stabilized rocket propulsion. Current computer simulations suggest that muzzle velocities in excess of 8000 m/s are possible with this technology, provided fuel-rich H2-O2 mixtures are used, but the problem of accelerating the payload to the point where ignition can take place remains unsolved. Moreover, the scalability of ram accelerators has not been determined, which means that it might not work for massive payloads.